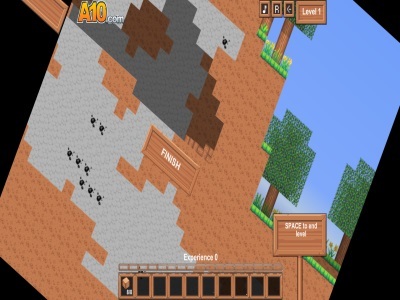 Mine IT offers players a new way to transport resources in Minecraft. To carry the resources to the finished line, you own magic to make Minecraft rotate to the left of right. These resources are cut into a good size, so it is not difficult for you to deliver all of the blocks at the same time. Accomplishing each given task permits you to unlock a next level. There are 15 levels. Your magic is from A and D keys. They will make you rotate Minecraft. R is to reset the game. Clicking at the symbol of music helps players to turn off music.